My friend is finally having her first baby and it's a boy. 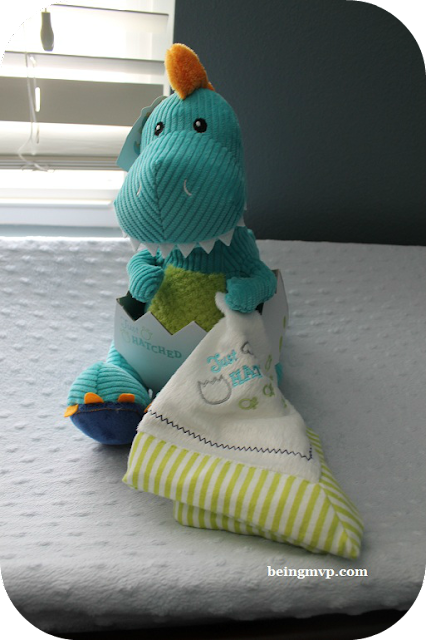 She will be having her baby shower in a few weeks and a wonderful gift is going to be the "Just Hatched" Plush Dinosaur and Lovie from baby aspen. The plush dinosaur is colorful and bright, made with different textured fabrics to appeal to a baby's senses. It is very well made and on par with other baby aspen products I own. The body is soft yet firm and the perfect baby shower gift for either a boy or girl. The lovie is a white velour 12 inch square with a flannel trim. You can opt to get it embroidered which is super nice when giving as a gift. It can definitely be a treasured item that the mother can save for the child as they grow older. The presentation gets a plus because it comes nestled in a cardboard egg - you can just toss into a gift bag and you are set. Baby Aspen offers many different baby boutique items that are just precious. I am kinda crushing on the Beach Bums diaper covers. Buy It: You can purchase the Dinosaur Plush for $32.19. Make sure to connect with Baby Aspen on Facebook, Twitter and Pinterest! That is so cute.. I love that you can personalize it. That is adorable!! My grandson would love to have this to snuggle with in his bed! Love this and it would make a perfect baby shower gift! Aw! He is just adorable! Looks like he could be a child's best little friend. Thanks for sharing. adorable! this is perfect for my new nephew thats due on Sept.! This is one of the cutest little gift ideas I've seen in a long while... pinned this post so I know where to find it for future baby gifts! Thanks! This is so adorable! I love that you can get it embroidered - makes it more personal. Thanks so much Elizabeth! I agree, this plush is so adorable and so does its love! I invite you to go to NanyCrafts.com and find Baby Aspen's full collection!